You may also find our user guide useful. What problem does OurGroceries solve? How much does OurGroceries cost? Can I pay to get rid of the ads? Must I purchase an upgrade for each device I own? How do I transfer the upgrade to my new phone? What devices is OurGroceries available for? How do I get OurGroceries? How do I delete my OurGroceries account? Do I have to type in the full grocery item name each time? How do I delete an item from the master list? Can OurGroceries keep track of multiple shopping lists? Can OurGroceries keep track of recipes? How do I rename or delete a shopping list or recipe? Does OurGroceries allow you to change the order of items in the list or categorize them? Can OurGroceries keep a backup of my grocery list in case my phone crashes? I accidentally crossed an item off the list. Can I undo that to bring the item back? How can I move an item to a different list? How do I get rid of the number on the corner of the app icon on my home screen? Can I add items to OurGroceries using Amazon Alexa? Can you make a German version of the Alexa skill? Can I add items to OurGroceries using Google Assistant (Google Home, etc.)? How do I print a shopping list or recipe? Can I import or export my lists and items? Can OurGroceries add items by scanning barcodes? Can OurGroceries keep track of prices? Can I keep some lists private? Will you support IFTTT, Fitbit, or Samsung Gear? I’m having problems running OurGroceries on my BlackBerry. My partner and I installed OurGroceries. Why are we seeing different lists? Where is the menu button on Android? Why are the website’s shopping lists different from those on my mobile phone? I followed the instructions. Why didn’t I receive a confirmation email? How do I stop sharing the list with my partner? How do I transfer my lists to my new phone? I cross off items by accident at the store. The app keeps freezing on my iPhone. I can’t link my Google Home or Google Assistant to my OurGroceries account. How do I unlink my Google Home or Google Assistant account? I add an item using Alexa, but the item does not show up on my list. On Android I can no longer choose how to send my list. A list is missing on my Wear watch. OurGroceries on my Apple Watch won’t connect. OurGroceries lets you keep a single set of grocery lists for your family or household. Everyone can edit these lists on their mobile phone or web browser. Whenever anyone modifies a list, everyone else sees the changes right away. For example, you might be at work and remember that you’re out of coffee. You use the OurGroceries application on your mobile phone to add it to the list. If your partner happens to go to the store later that day, they’ll see the new item on their mobile phone and pick up some coffee. Once they do so, they can cross it off the list and it will be crossed off on your list too—automatically. OurGroceries is free! We show unobtrusive ads at the top of the screen to help pay for development costs. On iPhone this is an in-app purchase. Run OurGroceries, go to “Settings”, and select “Turn Off Ads”. On Android this is a separate app, called “OurGroceries Key”, that you install. The Key has no interface. Its existence on your phone causes OurGroceries to stop showing ads. To install the Key, run OurGroceries, pop up the menu, select “Settings”, and select “Turn Off Ads”. You can add photos to items to make sure that your partner gets exactly the item you have in mind. On the Android app you add items by scanning their barcodes (UPC). Learn more about barcode scanning. The upgrade (see previous question) is associated with the iTunes or Google account you use to buy it, not with the OurGroceries account you use for sharing your shopping lists. On iOS, if two devices uses the same iTunes account, the second upgrade will be free. If the second upgrade is on a phone with a different iTunes account, then it must be paid for again. Apple does not permit in-app purchases to be shared using Apple Family Sharing. On Android, the upgrade is done by purchasing the separate OurGroceries Key app. The upgrade is only free to family members who are signed in to their phone using the same Google account as the original purchaser. In any case neither Apple nor Google permit us to share the upgrade from one type of device to the other (e.g., upgrading on Android and sharing that upgrade to an iOS device). The OurGroceries upgrade is tied to your app store account on your phone, not to your OurGroceries account. The app store keeps track of your upgrade and will let you upgrade again free on your new phone, as long as you’re signed in to the same app store account. On iOS, install OurGroceries from the App Store. Launch it, find the “Settings” menu, then “Turn Off Ads”, and tap the “Restore” button. On Android, install OurGroceries from the Play Store. Launch it, find the “Settings” menu, then “Turn Off Ads”, and tap the “Upgrade” button. You’ll be taken to the Play Store, where you can install the “OurGroceries Key” app. Again, these upgrades should be free, but only if you’re signed into the app store using the same Google or Apple account that you used to upgrade the first time. iPhone®, iPad®, and iPod touch® running iOS 8.0 or newer. We also support Apple Watch. Android™ devices running Android 4.0 or newer. We also support Android Wear watches. Amazon Alexa devices (learn more). Google Assistant devices (learn more). Desktop web browsers (try it now!). Visit our download page to download OurGroceries. Please see our download page for instructions. You can also see and edit Your Lists online. If your email address has changed and you want to use your new email address in OurGroceries, go to the Settings screen on our website and find the section called “Change email address”. You'll also need to enter your existing OurGroceries password. If you can't sign in to the website (because you forgot your password or never set one up), and no longer have access to your old email address to set or reset your password, then contact us and we will perform the process for you. To change the password of your OurGroceries account, go to the Settings screen on our website and find the section called “Change password”. You'll need to enter your existing OurGroceries password. If you can't sign in to the website (because you forgot your password or never set one up), select “please make up a new one and email it to me” from the sign-in screen. To delete your OurGroceries account, sign in to our website, click the “Settings” link in the upper-right, then click the red “Delete Account” button. No, OurGroceries keeps track of the items you’ve entered before and lets you search through them when adding an item. If there’s an item you want to remove from this list, tap the gray “×” to the right of the item name to delete it. OurGroceries automatically shows you the best matches as you type an item’s name, so you’ll rarely have to type more than the first letter or two. The master list (the list of all the items you’ve ever entered; see previous question) is displayed when you add an item to a grocery list. If there’s an item that you want removed from the master list, tap the “×” icon at the right of the row. You can delete all items in your master list by signing in to our website, visiting the Your Lists page, clicking the “Manage master list” button, scrolling to the bottom, and clicking the “Delete all items" button. Yes! You can have one list for each store (Safeway, Costco, Home Depot), one list for each type of store (hardware store, drugstore, butcher), and even lists for things not related to shopping (to do, questions for the pediatrician). All lists are shared amongst household members and are updated automatically within seconds. Yes! You can keep track of recipes that you prepare often, along with their main ingredients. You can use this list to inspire you next time you have to make a dinner decision and can’t remember which dishes you haven’t made in a while. The recipes don’t include minor ingredients (such as water or salt)—just the key ingredients, so that you can quickly check which ones you already have and easily add the rest to your grocery list. You can also keep track of the recipe instructions in the recipe notes field. That’s also a good place to put a link back to a recipe web page, if you found the recipe online. On iPhone, iPad, and iPod touch: While on the top-level list of lists, tap the information icon at the right of the list you want to rename or delete. On Android: While in the shopping list or recipe itself, tap the menu button. The menu contains options to rename or delete the list. Yes! You can drag items around your shopping lists to change their order (learn how). You can also create categories or aisles and drag items into them to make shopping faster and easier (learn more). OurGroceries will remember the order and categories of items so that next time you create a shopping list the items will already be in the order you like to walk through the store. There’s no undo mechanism, but the crossed-off items are ordered so that the most recently crossed-off items are at the bottom. You can scroll to the bottom of the list and tap the item to bring it back to the list. If this is a frequent problem, you can make it harder to cross items off. Tap the information icon at the right of the item you want to move. This will show the item details screen, where you can rename the item, change its quantities, delete it, change its category, add a photo, and move it to a different list. You can “star” individual items in your shopping list or recipe. To star an item, visit its detail page by tapping the “i” in the circle at the right of the item label, then tap the star button. To unstar an item, tap its star button again. A starred item will show a yellow star in the list. These stars have no other effect—they’re purely visual. You can use them for whatever you want. For example, a star might indicate that you have a coupon for this item, or that this item is urgently needed, or that a particular person is responsible for buying this item. Scroll down and tap on “OurGroceries”, then tap “Notifications”, then turn off “Badge App Icon”. Can I add items to OurGroceries using Amazon Alexa (Amazon Echo, Echo Dot, Amazon Tap)? If you own an Amazon Echo, or any Alexa-enabled device, you can ask it to add items to your OurGroceries shopping lists using your voice. See the full instructions in the user guide. We’re not currently planning to make a German version of our Alexa skill. It has been surprisingly difficult to make an English version of a voice interface. It would take a lot more than a simple translation to make a German version, and we’d rather spend that time on features that all OurGroceries users can benefit from. Can I add items to OurGroceries using Google Assistant (Google Home)? If you own a Google Home or other Google Assistant device, you can ask it to add items to your OurGroceries shopping lists using your voice. See the full instructions in the user guide. Sign in to our website using your computer, find the shopping list or recipe you’d like to print, then click the “Print” button at the bottom of the page. You can also just print the page directly (Ctrl-P on Windows, Command-P on Mac). The printed version will be paper-friendly (it won’t have the buttons or the website header). If you’d like to put each item in a category, you can download our CSV template and fill it out in a spreadsheet program. OurGroceries will also automatically detect if the file is a CSV file that was exported from Out of Milk, and properly import the quantities, units, barcodes, and categories. You can export all of your data from the Settings page of our website. Look for the “Export Data” button. Note that this data is not in a format that can currently be imported back into OurGroceries using the above mechanism. We currently support barcode scanning on the Android app as a premium feature. Learn more about upgrading. Note that our product database is rather U.S.-centric. Before upgrading, test this feature to make sure that we have the products you regularly use. Tap the barcode (UPC) icon in the upper-right of the shopping list and scan a barcode. OurGroceries will tell you what it thinks the item is. We’ve had many requests for price tracking, and it’s on our list of features to add in a future update. We’ve had several requests for keeping some lists private, and it’s on our list of features to add in a future update. IFTTT charges $3000 per year for integration, and we do not currently think that we would make that back in additional revenue. We do not currently plan to support Fitbit devices. We do not currently plan to support Samsung Gear watches. There is apparently a Gear app called Your Grocery List that works with OurGroceries. It was not developed by us and we do not provide technical support for it. Sorry, we no longer support the BlackBerry platform or make OurGroceries available on the BlackBerry World app store. You can install OurGroceries on BlackBerry 10 by first installing the Amazon Appstore app, and from there installing OurGroceries, but we do not provide support for OurGroceries when installed this way. Note that if you purchase the OurGroceries Key through the Snap app, it may not work once installed and it may not remove the ads in the OurGroceries app. We are not responsible for any purchase made on the BlackBerry platform. A common mistake is for each person to create their own account with their own email address. This creates two unrelated and unconnected accounts. Pick one email address (either) for the account and sign in to it from all devices. Another common problem is that the OurGroceries app may not have permission to contact our server. To check this, launch OurGroceries, go to its Settings menu, then to the About screen. It’ll tell you when it last contacted our server, which should always be less than 20 seconds ago. If it’s more than that, then the phone may be blocking OurGroceries. Launch the phone’s Settings app, find OurGroceries there, and see if it’s missing the permission to use the network. The menu button on Android has three vertical dots on it and is located in the upper-right of the screen. On some devices this button will be missing, and you should instead tap (or long-press) one of the phone’s built-in buttons below the display. This will often be the app-switching button, which looks like two overlapping squares. If you’ve already entered an email address into OurGroceries on your mobile phone (e.g., to share with your partner’s phone), then you must enter that same email address when signing in to “Your Lists” on the web site. If you’ve never entered an email address into OurGroceries on your phone, then set up list sharing now using the same email address that you used on the web. See above for instructions. Remember to use the same email address for all your mobile devices and for the web interface. It’s what ties them all together and lets them synchronize with one another. These types of automated emails often get mis-classified as spam. We’ve seen problems with both Yahoo and Hotmail. Check your spam folder for the confirmation email. Also, double-check the spelling of the email address you entered in OurGroceries. It’s easy to get one letter wrong, such as “gmail.con” instead of “gmail.com”. Sometimes the Yahoo bulk-email folder is configured to delete spam immediately. If your spam folder is empty, do the following: Click “Options” in the upper-right, then “Mail Options” in the drop-down menu, then “Spam” in the left-hand pane. Look at the “Empty Spam folder” option. Make sure it’s set to anything other than “immediately”, then click “Save Changes” at the top. You’ll need to ask OurGroceries to send you the confirmation email again (see next paragraph). To send the confirmation email again, launch OurGroceries, go to the Settings screen, and press the Send button. If you’re not in a position to ask your former partner to change their OurGroceries settings, then visit the settings page on our website. From there you can see the list of devices in your account and remove the ones you no longer want to synchronize with. First, be sure that your old phone (the one with OurGroceries installed and your lists on it) is signed in to your OurGroceries account. Do this by launching OurGroceries, going to Settings, then find Sign in. It will tell you whether you are signed in. If not, follow the on-screen instructions, or learn more here. Then, on your new phone, repeat the above procedure with the same email address. As a bonus, now that your email address is associated with your lists, you can use our website’s Your Lists section to view and modify your lists! On Android, bring up the menu (the button with three vertical dots), tap Settings, then find Cross-off action. You can choose Long press to make it harder to cross items off. On iPhone, bring up the settings page (the button with gears), then find Cross-off Action. You can choose Swipe to make it harder to cross items off. This started happening to a few of our iOS users in mid February 2019. We believe this is caused by a targeted ad that is somehow causing the app to freeze. We’re working with Google (our ad provider) on a fix. In the meantime, you can solve the problem by turning on “Limit Ad Tracking” on your phone. This will cause the ads shown to be less targeted to you, and you will instead get generic ads that won’t freeze up your phone. To turn on “Limit Ad Tracking”, launch the iPhone’s Settings app, tap “Privacy”, tap “Advertising” (at the very bottom), turn on “Limit Ad Tracking”, then tap “Reset Advertising Identifier”. After that, if the freezes persist, please contact us. OurGroceries supports adding items using Google Home or Google Assistant. (See instructions.) Sometimes the process of linking the two accounts does not work. After entering your OurGroceries email address and password, the page will hang or display an error. Unlink your OurGroceries account. See instructions. When linking your account, in the sign-in screen for OurGroceries, open the menu in the upper-right (three vertical dots) and choose “Open in Chrome” or “Open in interner browser”. Sign in using the real browser. If Chrome is not your default browser, try making it your default browser temporarily. Use another phone. Some Android users have had luck using their partner’s iPhone. Run the Home app on your Android phone. Tap the account tab in the lower-right (it looks like a person's face in a circle). Scroll to the bottom and tap “Explore”. In the search field at the top, enter “OurGroceries”. Tap the “OurGroceries” search result row. Scroll to the bottom. Find the section called “Account linking”. Tap the “Unlink” button to the right. Run the Google Assistant app on your iOS phone. Tap the icon in the lower-left that looks like a compass. Scroll to the bottom. Find the section called “Account status”. Tap the “Unlink” button to the right. Long-press the home button on your phone to bring up the Google Assistant. Tap the icon in the upper-right that looks like a compass. If you have multiple profiles on your Alexa device, be sure that the active profile is the one you installed the skill on. It’s easiest to install the OurGroceries skill on all your profiles. Be sure to include the “ask OurGroceries” phrase when speaking, or Alexa will think that you’re adding an item to its built-in shopping list. If Alexa acknowledges your request but the item does not show up on your phone’s list in OurGroceries, then there are two possibilities: One is that Alexa is adding items to her own list; the other is that she’s adding it to OurGroceries, but to a different account than the one that’s on your phone. If, when you say, “Alexa, ask OurGroceries to add milk to (list name)” she replies with, “Added milk to (list name)”, then she’s adding it to OurGroceries. If instead she replies with, “I’ve added milk to your shopping list”, then she’s adding it to her own list. Be sure to install the OurGroceries skill and to phrase the request properly. See here for instructions. On your phone, launch OurGroceries, go to Settings, then go to the “Sign in” screen. The screen should tell you which account you are signed in to. Sign in to our website using that email address. Use the password you had previously created to sign in to Alexa. Go to Settings and verify at the bottom that “Amazon Alexa” is one of the devices, and that it was used recently (when you most recently added an item using Alexa). If not, then the OurGroceries skill on Alexa must be signed into a different OurGroceries account. Remove the skill and add it again using the Alexa mobile app on your phone. In addition, after adding an item using Alexa, you can use the Alexa mobile app on your phone to double-check what she thinks you said. Normally, when you choose the “Send list” or “Send recipe” option from the shopping list or recipe menu, Android asks you which app you want to use to send the list. If you tap the “Just once” button, Android will ask you again next time. If you instead tap the “Always” button, then Android will remember your choice and you will no longer be asked which app to use to send your list or recipe. Launch the Android Settings app. Find the “Apps & notifications” section. It may just be called “Apps” on your version of Android. Find the app that was set to always be used. 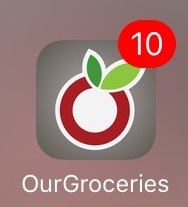 This is not OurGroceries, this is the app that comes up automatically when you are trying to send your list (for example, your email program, or Facebook). Tap the “Clear Defaults” button. Android Wear has a limit on the amount of information that can be passed from the phone to the watch, and some long lists exceed that limit, causing the list to not show up. If you have hundreds of crossed-off items on your list, either delete them all with the “Delete all crossed-off items” row, or delete enough items to go below the limit. There’s no set number of items for the limit because it depends on the amount of information in each item, but lists with a few hundred items should work. When you first launch the OurGroceries app on your Apple Watch, it will ask you to launch the OurGroceries app on your iPhone. This should immediately “pair” the two, but sometimes this doesn’t work. It seems that in some cases, Apple Watch doesn’t recognize that the watch app and the phone app are both part of the same app and should be linked. Uninstall and re-install the OurGroceries watch app (from the iPhone’s “Watch” app). Uninstall both the OurGroceries watch app and the OurGroceries phone app, and then re-install the OurGroceries phone app from the App Store. Then install the watch app. Make sure list sharing is set up first so you don’t lose your lists! Unpair your Apple Watch from your iPhone. Then re-pair your watch to your iPhone. We know this is a pain and takes a long time, but in at least one case this was the only way we found to force Apple Watch to fix the problem.